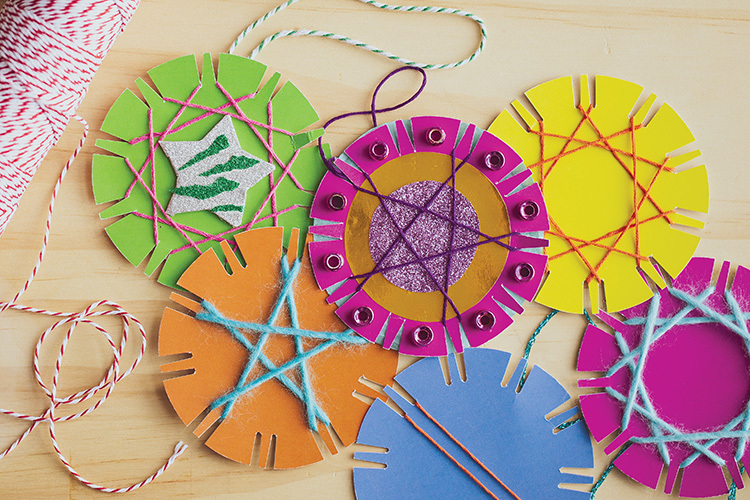 Use the Cardboard Weaving Maths Baubles as the starting point for this fun activity. Using the 10 points around the bauble, multiply and weave star patterns for numbers 1-9. Step 1. Decorate the centre of a bauble using collage papers. Step 2. Carefully punch a hole between two of the spokes – this will be used later to hang your finished bauble. Step 3. Cut a 1m length of cotton thread or yarn. Step 4. Follow the instructions included in the cardboard weaving maths bauble pack to explore the various patterns created by the different times tables. Step 5. Cover the reverse side of the bauble with a flattened patty pan, and glue in place. Step 6. Add further embellishments to finish decorating the bauble and create a hanger. Step 7. Display on the Christmas tree, or hang from a suction cup to create a striking window decoration.